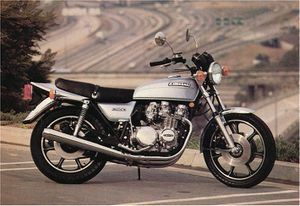 The Kawasaki KZ650C is a motorcycle produced by Kawasaki from 1977 to 1979. 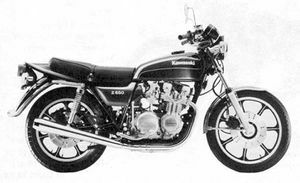 The KZ650C was a modified KZ650B. 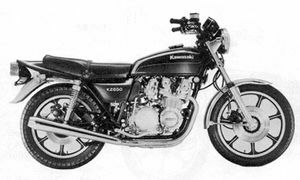 Modified KZ650B. Features different painting, solid wheels, front dual - rear single disc brakes, and four-way flashers. Major Changes: Color, marking, carburetor, and brake master cylinder. Diaphragm fuel tap adopted. Needle bearings are used in swing arm. 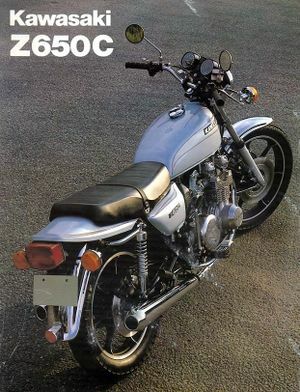 This was better known as the Z650 Custom. It was only offered in the UK in one colour metallic stardust silver, the same colour as the recently launched Z1-R. The motor was a standard B2 unit but the custom was much modified elsewhere. 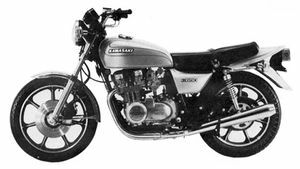 Kawasaki fitted seven spoke alloy wheels with twin disks up front and a disk at the rear. The bold new graphics made this model stand out from the crowd and the C was a very good seller. The first batch of bikes in the UK came with a free colour matched helmet. This model was only offered in certain markets so may not have been available in your particular country. Remarks: Modified KZ650B. Cast wheels, front dual disc and rear single disc brakes. 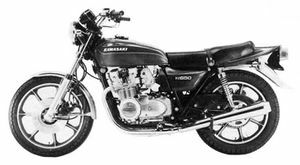 The C3 was the first Kawasaki model to use the new all weather sintered disk pads and braking in the wet was much improved. The bike was once again only offered in one colour, luminous dark blue. The Speedo now incorporated km/h markings as well as MPH and the rear caliper was changed to accept the new square sintered pads. The side panel badges were also slightly changed. Many considered the C3 to be the best of the range. This was the last of the C range in the UK although there was a C4 elsewhere, available in black or red. Major Changes: Color & graphic. This page was last edited on 21 January 2011, at 00:22.